Château Pontet Canet gilt als Vorreiter des biologischen Weinbaus in Bordeaux. Mit diesem Jahrgang hat die Familie Tesseron endgültig in die absolute Spitzenklasse in Bordeaux aufgeschlossen. Ein wunderschöner Wein, der einmal mehr die Finesse und große Klasse des Terroirs von Pontet-Canet zum Ausdruck bringt. An absolutely amazing wine, from grapes harvested between the end of September and October 17, this blend of 65% Cabernet Sauvignon, 30% Merlot and the rest Cabernet Franc and Petit Verdot has close to 15% natural alcohol. It comes from one of the few biodynamic vineyards in Bordeaux, but you are likely to see many more, given the success that Tesseron seems to be having at all levels, both in his vineyards and in his fermentation/winemaking. An astounding, compelling wine with the classic Pauillac nose more often associated with its cross-street neighbor, Mouton-Rothschild, creme de cassis, there are also some violets and other assorted floral notes. The wine has off-the-charts massiveness and intensity but never comes across as heavy, overbearing or astringent. The freshness, laser-like precision, and full-bodied, massive richness and extract are simply remarkable to behold and experience. It is very easy, to become jaded tasting such great wines from a great vintage, but it is really a privilege to taste something as amazing as this. Unfortunately, it needs a good decade of cellaring, and that’s assuming it doesn’t close down over the next few years. This is a 50- to 75-year wine from one of the half-dozen or so most compulsive and obsessive proprietors in all of Bordeaux. Is there anything that proprietor Alfred Tesseron is not doing right? Talk about an estate that is on top of its game! 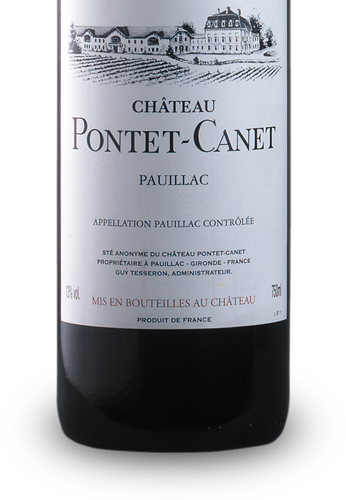 Pontet-Canet’s 2010 is a more structured, tannic and restrained version of their most recent perfect wine, the 2009. Kudos to Pontet-Canet! This is big, broad and powerfully rendered, but remarkably polished and refined at the same time. An enormous core of roasted fig, blackberry and black currant fruit is suavely wrapped with roasted apple wood and sandalwood, while dark espresso, loam and warm paving stone notes drive the finish. Very long, with a great tug of scorched earth at the end. A terrific combination of power and precision. Best from 2020 through 2040. Dieser Château Pontet Canet 5. Cru Classé Pauillac ist ein ganz besonderes Stück aus Pauillac. Zunächst blicken wir kurz auf die Geschichte. Pauillac ist ein Weinbaugebiet im Médoc, einer „Halbinsel“ In der Weinbauregion Bordeaux. Charakteristisch für dieses Weinbaugebiet ist die Vielfalt der einzelnen Weingüter. Sie sind zu meist herrliche Schlösschen (Châteaux). Jedes dieser Châteaux hat seine eigene Geschichte und somit seine eigene Art und Tradition Weine zu erzeugen. Mitten im Herzen des Weinbaugebietes Pauillac liegt das Château Pontet-Canet. Die Weinberge des Château werden überwiegend mit Cabernet Sauvignon bepflanzt. Diese schwererziehbare Rebsorte hat sich mit den Böden in Pauillac angefreundet und bringt seit jeher exzellente Weine voller Finesse hervor. Einer dieser Weine ist der Château Pontet Canet 5. Cru Classé Pauillac. Sein überwiegender Anteil von Cabernet Sauvignon wird durch Hinzugabe von Merlot, Petit Verdot und Cabernet Franc zu einem hervorragenden Wein abgerundet. Nicht umsonst ist der Château Pontet Canet 5. Cru Classé Pauillac ein so weltweit bekannter Wein. Dies ist dem Engagement der jeweiligen Besitzerfamilien des Château Pontet-Canet zu verdanken. Heute ist das Château in Besitz der Gebrüder Alfred und Gérard Tesserons, Vorreiter des biodynamischen Weinbaus in der Region. Am Gaumen offenbaren sich die Tannine mit einer großen Bandbreite, charakteristischer Finesse und unglaublich seltener Präzision. Begeistert mit einem explosiven, vielschichtigen Bouquet von roten und schwarzen Waldfrüchten sowie eleganten mineralischen Anklängen.